November was a great month for me. Why? Because my blog brought in over $1,000! I’m usually quite good at predicting my next month’s income (don’t think I’ve been wrong yet), and while I had predicted last month that November might set a new record, I wasn’t expecting it to do this well. Why am I so happy? It’s not the actual money I’m thrilled about; my poker forum made over $6,000 in November. It’s the fact that I hit, in my opinion, the most important monetary milestone. The $1,000 milestone mark is so important in my eyes because I honestly believe that if you can make $1,000 from your blog, that you can make $2,000. And if you can make $2,000 from your blog, there’s nothing stopping from you making $5,000 or $10,000. Case in point, exactly one year ago John Chow was making only $1,000 a month from his blog. And now he’s making over $25,000. Now, I’m obviously no John Chow, but this illustrates my point perfectly. 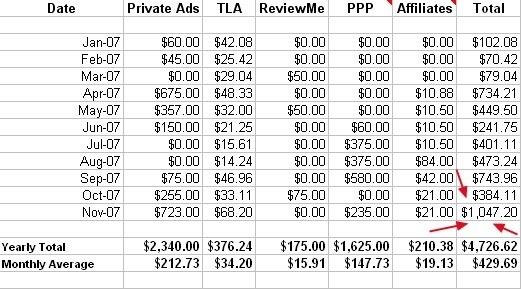 Private Ads still make up the majority of my revenue, but overall paid reviews are still in the lead (I do a bunch of paid reviews privately which count as Private Ads). Look ma, I’m into the 4-digits now! I’m extremely happy about this milestone… it really means a lot to me. My goal for December is to set a new record and hit $1,200. This won’t exactly be easy, but I’m going to try anyway. A lot of it depends on how many (if any) paid reviews or plugs I get since they make up a significant portion of my blog’s income. However, I do have heavy demand for ads on my blog. And by heavy I mean heavy; all my ads are sold out and I currently have 10 advertisers on the waiting list. I’ll be making another post soon on how I plan to help increase my blog earnings in December soon, so stay tuned (and subscribe to my RSS!). Congrats! It is hard getting traction, but looks like you’ve hit a good milestone. Added your RSS feed to my reader. It should be shorter to your next 1,000 is my guess. I make that much off-line in one day or two days… but, it is a goal of mine to make money online and you do give good hope. So what did you do different this month than the previous months to increase your income by so much? The new design give me more room to sell ads, and I started selling 125×125 banners. I guess I should “actually” monetize my site. Oh well, I will still try and try until I get online monetization a success (live on online income). Congrats on your earnings Tyler! I don’t see why we need this graphs and what not to see your blog income. Couldn’t you instead spend this time on more important things like your forums, etc? We can all see that your last month’s income spiked up but this mainly due to your private ad sale(s). Let’s instead see your blog income over a period of time. Steve, isn’t that a good thing he’s selling ad sales? He’s effectively monetizing his blog. Perhaps we’ll start to see even more posts as Tyler makes more money. – Such and such contest! – 40 hour work week challenge! – RSS readership new record! and the few odd minuscule morsels of information at are of any worth. This is why I think Tyler should instead focus on his other revenue streams and further monetize and improve them. This is just drops in the bucket and not worth anything to us the readers. Just an opinion of course. If anything looking at your split you are missing out on affiliate commissions. Your readers would benefit from you doing reviews of certain tools and eBooks – and you just simply need to slip your affiliate link in. A few honest reviews a month and you could easily double your earnings. Steve: why all the hate? As long as he’s making money from the blog – it shows how big of an earner he is. Stop the hating. I’m sure he’ll put more focus on his forums soon. Nice job hitting 1000. Sky’s the limit. Check out http://business-cards-print.com/ for some cards you can give out. Good job – just don’t start doing what a lot of bloggers have done lately and let your quality go straight downhill. Don’t know about you guys- but every time I’ve read a post on John Chow lately I keep asking myself “why the heck am I still subscribed?”. I just don’t find his blog interesting anymore. Congrats on the great earning numbers! good work! Nice work Tyler, here’s hoping the next goal comes quickly for you. 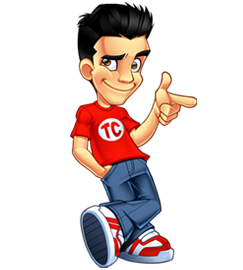 You should be careful with paid reviews and text links ads since that is against Google webmasters guidelines and might get you in trouble of loosing serps if any. Also, saying your earnings and source of earnings in public is nice thing to get attention, but your reviews may loose trust by your visitors and affiliate sales will drop. Can you give us an insight into the number of unique visitors/traffic per day/month etc? That can be found on my advertising page. As someone else said, I’d be careful with your text link ads and only link out to stuff that you know is ok. Whether you are doing well or badly it is all good experience. My advice would be to diversify and if one income stream dries up it’s not too much of a blow. Nice work with the poker forum earnings though. Nice going Tyler. You have a great story and $1,000 from just your blog is a huge achievement. Hope the next $1,000 comes quickly. Congrats. That is an awesome achievement. When you say private sales, is that just people using your Advertise link and contacting you directly? Yup, exactly. Ads that I sell privately, as opposed to an ad network or brokerage site. The new design is definitely helping the money flow, which was probably the main reason for the redesign. I always wondered why this blog was raking in money like crazy, especially with 900+ RSS readers. Thanks for the kind comments, guys. great job tyler. it’s really quite an achievement. congrats. and i’m glad you don’t have to login to comment anymore. big improvement. Wow, keep up the good work. 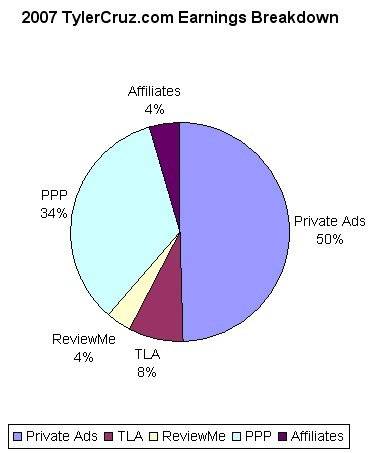 I will *really* have to start looking into selling private advertising as my Adsense eCPM keeps going down! Good work Tyler. From my observation it really pays to cut off the middle man eh? As far as I recall direct ads were also reportedly by far the biggest earners on John Chow’s blog. Great work Ty. Looks like December could be an interesting month for you? I too believe in growth of making money from your blog. Afterall, it’s what Yaro always pushes – what you put into it is what you’ll get out of it. Congratulations to you. I believe on your thinking that no one can stop you from earning on the net. But of course in earning more, you must also invest on it, and thats the hardest part.